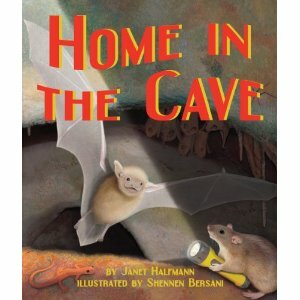 Home in the Cave is the first one we read and quite possibly my favorite. This, despite the fact that I am not fond of the little buggars. (We have had a bat or two inside our home. Two of which we've discovered flying over us in our bed at 2 a.m. Not exactly my idea of a good time or a welcome houseguest!) This one though is by one of our favorite animal authors, Janet Halfmann. In this story, Baby Bat loves his cave home and thinks he never wants to leave it, despite the fact that his mother is telling him he needs to practice flying so that he can go out and hunt for his own food. He makes friends with another cave dweller, a packrat, who shows him around the cave and teaches him how necessary bats are when it comes to sustaining cave life for other animals. This book is informative and interesting. 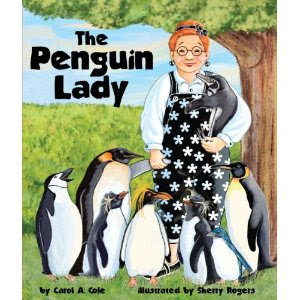 The Penguin Lady , by Carol A. Cole, is about a lady who loves penguins. (Yes, I bet you could not guess that. Aren't you thankful that you have me as a book guide and friend?!) This lady loves penguins to the extent that she always dresses in black and white. (Despite the fact that I frequently do this also should not suggest to my friends that I have an obsession with penguins.) The Penguin Lady also waddles when she walks. (I hope I do not.) She receives penguins as gifts until she has so many various types of penguins in her house that she calls the zoo and asks for help in housing them. She finds herself lonely after all of the penguins leave and so she starts building a new animal family involving another creature who is black and white. Can you guess which? 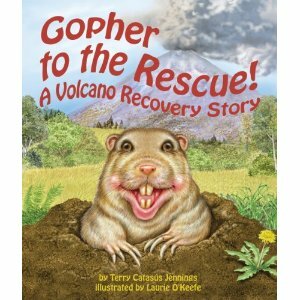 In this book by Terry Catasus Jennings, we learn about how the gopher is useful in restoring the soil after a volcano and returning life to the mountain. I can't say that the illustrations in this book are my favorite (the gopher's smile on the front cover actually drives me a bit crazy) but this didn't seem to phase Bookworm1. 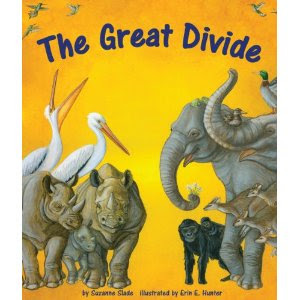 The Great Divide , by Suzanne Slade is definitely over my five-year-old's head but that doesn't prevent him from wanting to read it and it's definitely one I don't mind having around. This book combines math and animal science in a clever way, teaching children basic division while also telling you what groups of animals are named. For example, a group of squirrels is called a dray, a group of whales a pod and so on and so forth. The illustrations by Erin E. Hunter are very beautiful and fun to look at making this a pleasant read. Highly recommended. 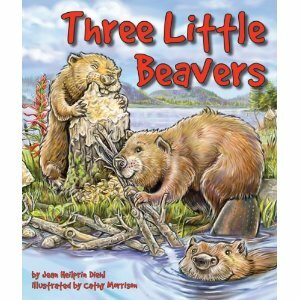 Lastly, we received a copy of Three Little Beavers which read more like a regular picture book story, as opposed to a fact filled tale. Written by Jean Heilprin Diehl, this book tells the story of Beatrix, Beverly, and Beaven Beaver. While Beverly and Beaven are skilled at being beavers, Beatrix is not so much. She runs away from home but finds herself trapped. When her siblings come to rescue her, they too are trapped. The humans have no intent to harm the beavers, but rather to build a habitat that will accommodate both man and beaver both. Honestly, this wasn't my favorite story n the batch but it's still about animals and so we read it through. Sylvan Dell Publishing has offered to give away ONE of the above titles to one of my readers here at Reading to Know. In order to win? This contest is open to U.S. Residents only and will be open through Wednesday, March 7th. THIS CONTEST IS NOW CLOSED. THE WINNER (as selected by Random. org) is #1 - Beth who chose Home in the Cave! Congrats, Beth! Thank you, Sylvan Dell Publishing, for sending copies of the above books our way and for offering up another to one of my readers here. Home at the Cave looks adorable! Home at the Cave looks like it would be a winner in my house. I think we'd LOVE Gopher to the Rescue. I think The Great Divide would be a runner up. M seems to really enjoy learning about groups...though likely over her head too since the kids are the same age. We'd like The Great Divide if we win. I bet our two boys would enjoy "Home at the Cave." Hmm...my kids would enjoy either Home in the Cave or Penguin Lady! They all look great! I would love to win Home in the Cave. Thank you! I would love to win Home in the Cave for my grandchildren. I know they would enjoy it! Those first two have great covers! I think we'd like At Home in the Cave best. I would like to win a copy of The Penguin Lady. My son has a collection of penguin items that began when he fell in love with penguins at age 6 (he's now almost 16 and still likes penguins). Thanks so much for the great review, and for all the wonderful comments about all of Sylvan Dell's books, including my book Home in the Cave. Good Luck to all the entrants in the giveaway, and Happy Reading! Home in the Cave sounds like it would be a favorite around here! I would love to win The Penguin Lady. My daughter would love this book. Please enter me. Thanks! I don't know how to pick just one, but The Three Beavers looks like something along M's reading level right now. Home in the Cave! We love Janet Halfmann books in my family.